Someone once said, “Writing about music is like dancing about architecture.” As if the two were so opposite that it was absurd to think of the one having anything to do with the other. But I’ve come to think they have a lot in common, especially since I joined the board of the Joe Goode Performance Group. Before I was an architect, I was a dancer. I fell in love with dance in college and started taking classical ballet classes. After I got my architecture degree, I performed with a local company. And when I moved to San Francisco, I kept on training through the adult program that San Francisco Ballet offered. I was working as an architect during the day and rushing off to evening classes as soon as I left work. Then the San Francisco Ballet ended its adult program, I became pregnant, and I stopped dancing. But I never lost my love for it. I’m in the middle of renovating my house, and the other day I found my pointe shoes and my pink leg warmers. I’ve been getting rid of a lot of stuff. But somehow, I can’t get rid of these yet. A few years ago, a friend of mine who was a professional dancer urged me to go see one of Joe Goode’s performances at the Yerba Buena Center for the Arts. “I really think you’d like him,” she said. That was the beginning of a total love affair with his work. It’s much more than just dance. It’s really dance theater, because he incorporates spoken word. Before anyone else, he had his dancers talking. And sometimes even singing. His method of creating dances reminds me of the way architects work. When he’s developing a piece, Joe always collaborates with other artists—the musicians, the set designer, sometimes a lighting designer, and the company members. It’s like an atelier studio in design school, where some people are working on buildings, some on serigraphy, and others on photography, all in the same room, all influencing each other’s outcomes. I wanted to get involved in the company. First, I volunteered to organize the food for the party celebrating the company’s 20th anniversary in 2006. Luckily, that went well, and they invited me to be on the board. It quickly became clear that the most important part of being a board member is fundraising. We are fortunate to get funded regularly through grants from arts organizations, but about a third of our revenue needs to come from donors. A board member is assigned to every donor who contributes more than $50, and board members meet those donors and invite them to performances and special events. I also help out with projects that are a little more closely related to what I do for a living. A couple of years ago, we learned about the opportunity to lease studio space at Project Artaud. We went through an RFP process and an interview and ultimately were selected. The space is perfect for installation pieces that Joe loves to create and are usually too big to be taken on the road. Plus, it’s in the Mission District close to public transportation, and it’s just a few blocks away from ODC Dance Commons. We also had to find a new rehearsal space when the previous one, in Emeryville, became unavailable. We scouted various possible locations and developed a budget. About a year ago, we moved into our new home in San Francisco. Joe is very interested in the architecture of the spaces he works in, more and more of his pieces are site-specific. For example, “grace@grace” took place at Grace Cathedral in San Francisco. Audiences were divided into small groups, which traveled different paths through the cathedral, seeing different parts of the dance at different vantage points—dancers in the nave, the side chapels, or the choir, some performing in concert with the architecture of the building, some not. It was breathtaking seeing them in those beautiful spaces. His 2009 piece “Traveling Light” worked in a similar way, but it was set in the San Francisco Old Mint. The audience traveled in several groups, first coming across dancers posing in each of the mint’s vaults. Then each group went to one of four different venues, one of which was the courtyard. 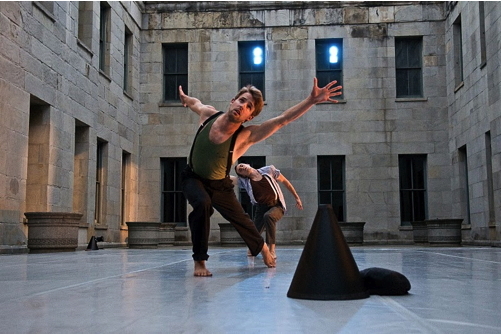 His dancers really interact with the space—sometimes they’re walking up on concrete beams 15 feet above the floor. I remember there was a dancer on the mezzanine of the two-story space off the courtyard—you didn’t notice her at first because other dancers were performing below her. Then she began to sing, and everyone looked up—she was dressed in Victorian costume, with a gigantic wig and an immense dress—maybe 13 feet tall. You realized she was standing on a ladder. 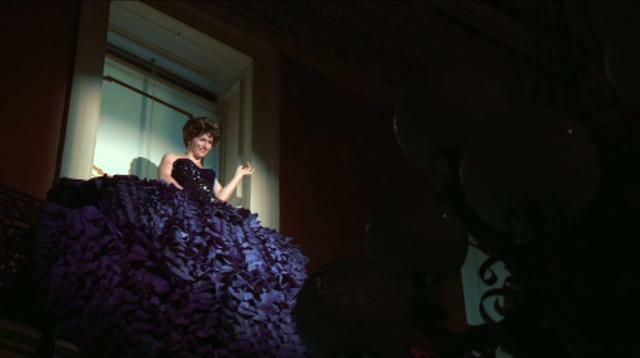 Then she let go of the dress, and it cascaded to the floor. It was amazing. Joe is currently talking with the board about his legacy. He has no interest in having other people perform his works in the future. Instead, he wants his process of creating dance theater to be his legacy. In that way, it’s a contrast to architecture, because although process is a huge part of it, in the end it’s all about the product. Working with Joe’s company has reinforced for me the strength of the collaborative process and reminded me that the best ideas can come from anywhere. It’s also made me much more appreciative of both our nonprofit clients who make art and our for-profit clients who help support the arts.